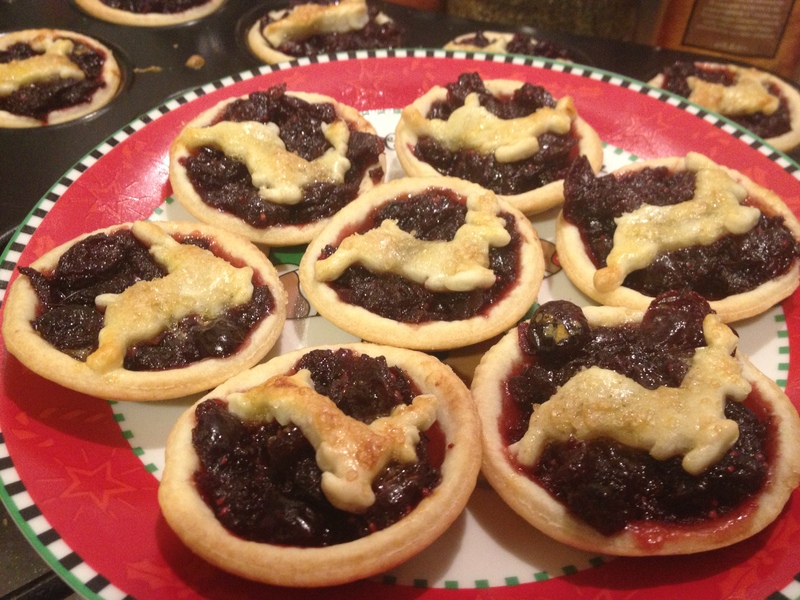 I love my Cranberry Mincemeat, as does pretty much everyone I know- even several who don’t really like mince pies! But cranberries don’t mix with certain medications, so since I’m off to visit relatives for Chrimble, I needed to make something everyone could enjoy. You can buy standard mincemeat in the shops, and sometimes very good ones, but they are often overly sweet or very acidic. Making your own is really simple, it just takes a little bit of time. And the flavour is always better. In the past I have made Bramley Apple and Clementine mincemeat to replace my favourite red concoction, but this year I’ve turned to Delia and her famous mincemeat recipe. You can find this recipe in her wonderful Happy Christmas book, or on her website, but here it is again. I’ve really made very few changes, and those are mainly based on what I had in at the time, rather than for flavour tweaks etc. Please note this makes PLENTY of mincemeat- you’ll have enough for pies and then some. You can easily half the recipe and still have oodles. In an oven proof mixing bowl (if you don’t have one, don’t panic- you can transfer the mix to an oven proof dish later) combine all the ingredients except the brandy and leave to infuse overnight. Cover the bowl with some loose cling film, foil or a tea towel to keep anything unwanted out. If you haven’t already, cover the mincemeat loosely with foil. Pop it in the oven at 120 c for 3 hours. After the 3 hours are up, remove it from the oven and stir occasionally as it cools. The melted fat will settle back into the mixture and coat the ingredients, rather than remaining in shreds. Once cold, mix the brandy through the delicious mixture and store in sterilised jars. Mincemeat recipes can look daunting, because of the amount of ingredients involved mainly. The truth is, they are sickening easy. All they need is a little time and simple cooking, and you’ll have something wonderful to eat this christmas season. Seriously. This stuff is super light and delicious, yet stupidly easy. Chop up your butter into chunks. Stick all the ingredients into a food processor and mix until they cream together into a dough ball. Chill the dough for at least an hour. You can keep it in the fridge for several days, or freeze it and thaw when needed. When needed, roll out thinly on a floured surface and cut out your shapes for the crust and top of the pies. Assemble, and bake at 190c for 9 minutes. I mixed up this recipe several years ago after a bullet-proof-pastry disaster nearly put me off making my own for life. This stuff is perfect- light and almost flaky, yet definitely a short crust. It’s sweet, but not overpoweringly so, and you can replace the almonds with more flour if your are avoiding nuts. You can also use this 5 minute miracle for larger puddings- I’ve tried and tested it with Apple Pie and Tart au Citron and it worked beautifully. You’ve just found your new go to pastry recipe, people. Go forth, and make pies. And sorry this is so late! I’ll be back up to date asap! Despite a mixed heritage, I’m British at heart; a fan of the royals, grey skies and our beautiful gentle countryside. I like our crisp winter mornings, and our crazy weather, the disdain of londoners and the rosy-apple folk who sell you apples or take you a-wassailing. I like getting lost in ancient woodlands, tripping on gnarled roots, and spotting the flit of birds or foxes or deer through the slender trunks of trees, dreaming them to be unicorns and spirits of old. Of our food heritage, I’m proud of a lot of things. Our fruit is wonderful- there’s nothing like a British strawberry, or Cherry, or our versatile, plentiful apples and plums and gages. Our brewing is top notch and real british ale makes the best gravy for pies and stews. My favourite traditional foodstuff, probably, is Mincemeat. Originally containing meat along with the mixed fruit and spice, over the centuries, with the availability of sugars far sweeter than other traditional sweeteners, as well as a change in tastes from the fruit/meat combinations popular in the 15th and 16th centuries to the modern palate, Mincemeat became a dessert item. Traditionally, even today, it contains suet or butter, but some prefer it without, whether they are vegetarian or not. Of course, vegetarian suet is available, but I confess that when it comes to homemade mincemeat, I don’t bother with suet of any sort. Delicious in pies and tarts, some cakes and other desserts, making my mincemeats is a Christmas tradition. In the past, it filled my old family home with the smell of fruit and booze and spice, but now I get to horde it all to myself. As I type, my fingers smell of brandy and clementine, and my latest batch is cooling on the hob, ready to be jarred up and saved to make mince pies for a party this weekend. 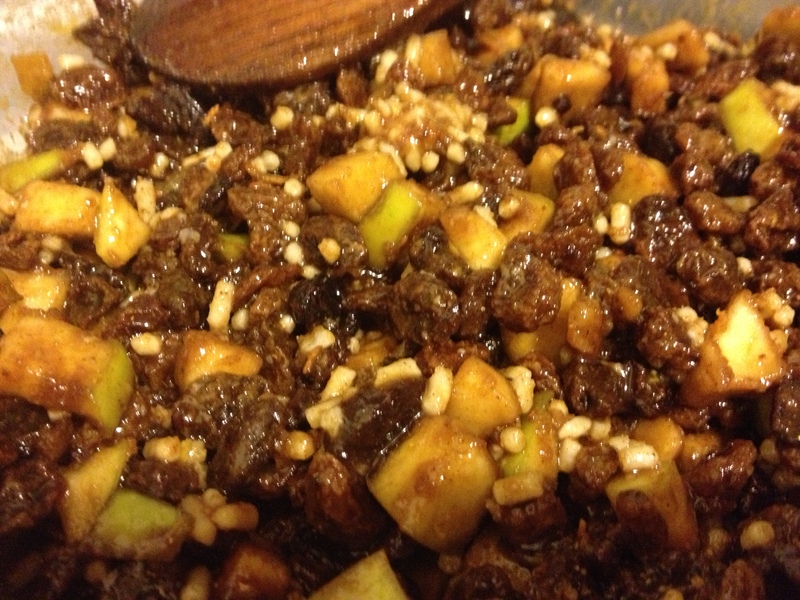 The best thing about Mincemeat is how variable it can be. Shop bought Mincemeat tends to taste the same, and that’s no crime, but when you make it yourself you can choose your favourite fruits to some extent, manage the spices to your taste, and make it as boozy as you like. I have two or three favourite recipes; a Cranberry one (originally by Nigella, and I’ve not changed much) which has converted many Mincemeat haters to the cause, a Bramley Apple and Clementine one of more traditional flavours that is also safe for my Grandparents to eat (Cranberries can play havoc with their medication) and a lighter, sweeter aromatic Sugarplum concoction. Over a low heat, add the sugar and port to your pan and stir gently until the sugar dissolves. Add the cranberries and coat in the port syrup, stirring as needed until the berries begin to pop. If you are using frozen fruit straight from the freezer, allow a few minutes extra for the fruit to defrost. Add the spices and dried fruit to the mix and stir in. If you are using the orange juice, just add and mix it in. If you use a clementine, squeeze the juice into the pan and add the juiced halves of the fruit to the mixture. Stir to combine. Let the mixture simmer over a low heat for 15-20 minutes until nearly all the berries are popped and the mixture is a deep, dark sultry red. Check it frequently in this time to make sure it doesn’t stick. Take the pan off the heat and allow the mixture to cool for 15-20 minutes. It will become quite jellied. Beat the honey, extracts and brandy vigorously into the mix until it becomes runnier and pot up, if storing, or pour into a storage bowl if you are going to use it within two weeks, and have fridge space. This recipe makes one good litre of Mincemeat- I filled a Kilner jar, with one pie’s worth left over. If you are going to give the mincemeat as a gift, or store in jars for more than a month or so, add a splash of brandy to the top of the jar to help keep if preserved. This concoction is obscenely red, with a few un-popped berries in this mix glowing like rubies. The flavour is tangy, sweet and spicy and the texture is jammy and delicious. I’ve been making this for several years now, and it makes me grin every time I do; it’s a treat for all the senses and so completely festive. My friends put in requests for pies made with this early in the year. Speaking of, I’d better get on with my pastry. A full photoset is up on the Tumblr page.